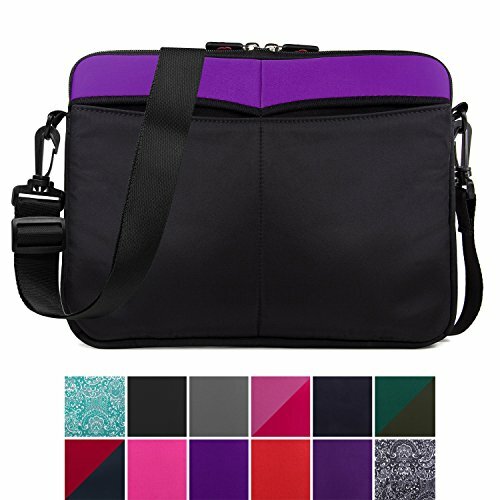 Reviewers are calling it "Amazing Bag" to carry alone or to go into a Backpack, Laptop Tote, Briefcase, Bag or Luggage along with your Cellphone, Jet pack, Pen, Pad, Magazines, Tracks, Etc. This Universal Sleeve has ample room for your device in the main compartment, as well as a Galaxy Note 8 and backup battery pack in the side pockets. Last but not least, a must-have built-in strap to use as a crossbody bag (48 inches drop). Internal dimensions (approximate) 13.35 x 10 x 1 inches. External dimensions (approximate) 13.8 x 10.5 x 1.7 inches. Don't see your model? Please refer to internal dimensions listed above. If you have any questions about this product by Kroo, contact us by completing and submitting the form below. If you are looking for a specif part number, please include it with your message.